Voters in the east African country of Tanzania go to the polls on Wednesday to choose a new president and parliament. National elections will also be taking place on the semi-autonomous islands of Zanzibar and Pemba, where campaigning has been marred by violent clashes. Who is standing for president? Ten candidates are in the running to replace the current president, Benjamin Mkapa, who is standing down after serving the maximum two terms. Mr Mkapa's ruling party has chosen Foreign Minister Jakaya Kikwete as its candidate. His running mate is the serving vice-president, Ali Sheni. A moderate Muslim, Mr Kikwete is a former army officer who worked his way through the party ranks before entering the cabinet in 1994. He has promised to continue the work of Mr Mkapa by speeding up economic development and safeguarding political stability. Mr Kikwete's main challenger is US-trained economist Ibrahim Lipumba. Mr Lipumba lost to Mr Mkapa in two previous bids for the presidency, the last time by a margin of over 50 per cent. A specialist in international trade with an academic background, he draws much of his support from coastal areas and the island of Zanzibar. Among the other candidates are veteran Labour Party politician Augustine Mrema, and Anna Claudia Senkoro, the only woman in the race. The presidential poll was originally slated for 30 October, but voting was postponed due to the death of a vice-presidential candidate from the opposition Chadema party. Eighteen parties are contesting this year's elections. The main rivalry, as in Zanzibar's elections at the end of October, is between the governing Chama Cha Mapinduzi (CCM) party, and the Civic United Front (CUF). The CCM has ruled Tanzania since 1977, first as the sole political party, then as the dominant one after a multi-party system was introduced in 1992. It portrays itself as a custodian of political stability and ethnic harmony, but has been accused by critics of engineering "racial animosity and flagrant political intrigues". The CUF, which lost out to the CCM in the 1995 and 2000 elections, is the main opposition party. It draws most of its support from Zanzibar, where it has its headquarters, but like other opposition parties has failed to attract much popular support on the mainland. Deriding the CCM as "socialist" during its electoral campaign - Tanzania formally ditched socialism in the mid-1980s - the CUF has argued that it was cheated in the Zanzibar polls in October. The shape of the Union of Tanzania is one of the key themes of this election, and has been a political headache for Tanzania's leaders since its founding in 1964. In semi-autonomous Zanzibar, many continue to have misgivings over the union, in the belief that the mainland benefits disproportionately from the nation's resources. The CUF, deriving much of its support from the isles, does not back the idea of dissolving the union, but some of its members have called for political power to be divided among a three-tier government. The economy is also causing concern. Although Tanzania has recently registered an impressive record of growth, the results are yet to trickle down to the most of its 38 million citizens and Tanzania remains one of the world's poorest countries. There are also fears of a rise in religious intolerance, and accusations from the isles against CCM presidential candidate Mr Kikwete that he is "waging war against Islam". What are the prospects of a fair election? Although October's local elections in Zanzibar were marred by violence and widespread claims of corruption, in contrast the campaign on the mainland for Tanzania's third multi-party elections has been relatively calm. In early August, to forestall any violence, 12 of the country's 18 registered parties signed a code of conduct with the NEC, discouraging candidates from using their local languages or English so as not to inflame ethnic passions, and instead speak Swahili. International observers met the head of the National Electoral Commission (NEC) in Dar es Salaam on 8 December to prepare for the elections. Nevertheless, there is also likely to be some dispute over this month's polls. CUF Secretary-General Seif Sharif Hamad warned at the party's last campaign rally that assurances the elections would be free and fair should not be believed. Around 16 million people are signed up to vote, and final results are expected within 72 hours of the close of polling. Voting in the previous elections in October 2000 went smoothly on the Tanzanian mainland, although Commonwealth observers dismissed the polls on Zanzibar as a "shambles". 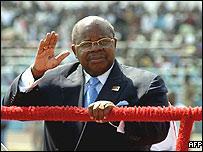 Mr Mkapa won a second term in office with 72% of the votes cast, while Mr Lipumba came a distant second with 16%. Turnout was high at 84%. The CCM enjoyed similar success in the parliamentary elections, winning 244 out of 268 seats, and also claimed the Zanzibar presidency.